The infamous SuperWeb LLC group has been very active these past few months since this group crafted numerous new adware programs. One of them is known as Cooking up Coupons. Like the majority of adware programs developed by the SuperWeb LLC group, Cooking up Coupons is advertised in a questionable way to say the least. On its official website this application is marketed as an excellent tool that should provide you with best discount deals and coupons; thus, should save you time and money while shopping online. While at first these statements sound tempting, you must know that Cooking up Coupons does not function the way it should. In fact it does the opposite; as long as this adware program is active on your PC, browsing the web will be an annoying task. Do not hesitate to use the removal guide that we provide below to delete Cooking up Coupons once and for all. Since it is known that Cooking up Coupons is yet another adware application created by the SuperWeb LLC group it is not surprising that it functions in a similar way as adware programs such as Box for You, Any Angle, SwizzleBizz and many others. Once this adware enters your operating system, it will, like many of its counterparts, flood your web browser with tons of third-party ads and annoying pop-ups. It is quite natural that fighting through ads presented by Cooking up Coupons every time you browse the web will make your life miserable, to put it mildly. Every ad and pop-up presented by Cooking up Coupons is utterly worthless because it will not help you with your online shopping in any way. The only way that you can restore the standard functionality of your web browser is by conducting a complete removal of Cooking up Coupons; otherwise the annoying activity will continue to bother you. 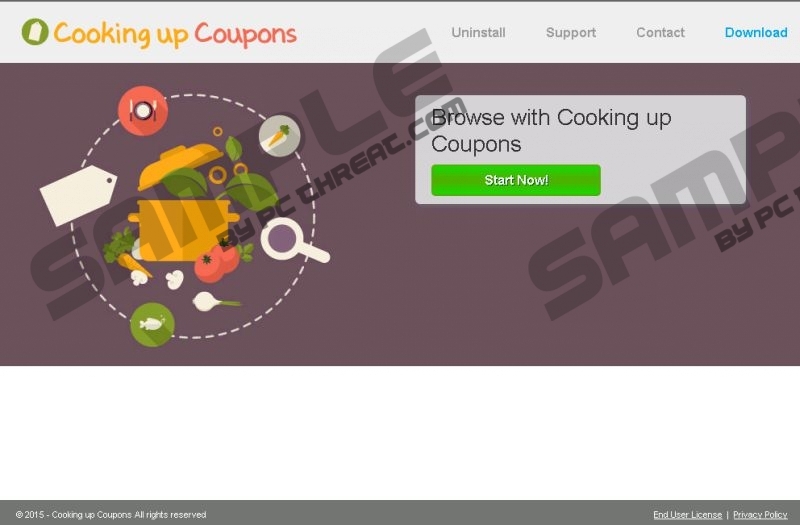 Since it is impossible to download Cooking up Coupons from its official websites, it is quite safe to assume that this adware is distributed in some other questionable way. It is not surprising that Cooking up Coupons is mostly distributed via software bundles since this way of spreading adware programs and other dubious applications is very popular. To avoid installers filled with various third-party applications make sure to download your software from official vendor’s websites as they do not tend to provide software bundles. In addition to that make sure to install a professional antimalware tool that would warn you about any questionable installers of dubious third-party websites. Make sure to execute the manual removal with your utmost attention as just one mistake could mean that the Cooking up Coupons was not removed entirely. This is a dangerous instance because leftover files or registry entries could be used to silently restore this intrusive adware program without any notification. To avoid such case, we strongly advise you to scan your PC with a professional antimalware tool, which would ensure that every single bit of Cooking up Coupons was removed successfully. Select Cooking up Coupons and click Remove. Select Cooking up Coupons and click the Uninstall button. Quick & tested solution for Cooking up Coupons removal.